The Chicago Cubs are in the midst of their best stretch of baseball in more than 100 years, but you might not know it. After winning the World Series in 2016, the Cubs made the postseason in each of the last two years, but they have been unable to replicate that magical October in 2016. And after Chicago saw the National League Central crown slip from their grasp last season, they could not overcome the Colorado Rockies in the wild card game. And as a new Major League Baseball season is upon us, the Cubs once again have what it takes to win the N.L. Central, but will they be able to do it? In four years as the manager of the Cubs, Joe Maddon has been pushing all of the right buttons as he initially took over a squad full of young talent who are now grizzled veterans. 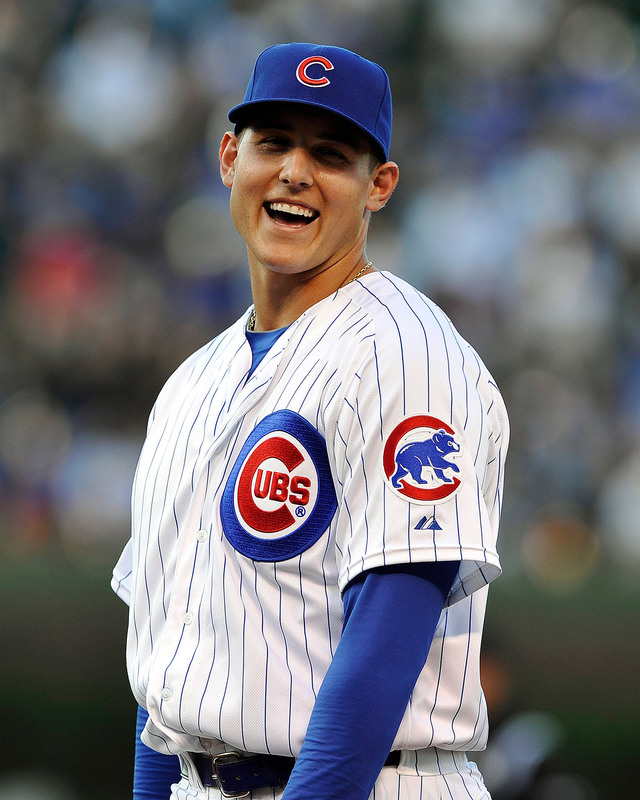 In seven seasons with the Cubs, first baseman Anthony Rizzo has been an anchor for this club. Rizzo knows what to do when Chicago has men on base as he’s driven in at least 100 runs in each of the last four years. And for a power hitter, Rizzo does not rack up the strikeouts as he has struck out less than 100 times in each of the last two years. Rizzo is a leader in the Cubs clubhouse, while he also is solid on defense as two of the last three years have seen win the Gold Glove Award at first base in the National League. In 2016 it was a marriage made in heaven between third baseman Kris Bryant and the Cubbies. Bryant was named as the National League MVP and he could do no wrong in helping Chicago win it all. But 2018 was not the case for Bryant as a shoulder injury limited him to just 102 games. Bryant was a shell of himself, while this off-season saw him turn down a contract extension from the Cubs. Bryant will definitely be looking to bounce back in a big way in 2019, but you have to wonder if there will be lingering ill-will between him and the Cubs front office. 2018 also saw the emergence of shortstop Javier Baez in regards to being a vital part of the Cubs offense. Last season Baez finished second in the National League MVP to Christian Yelich of the Milwaukee Brewers. But Baez’s numbers were nothing to sneeze at as he led the N.L. in home runs with 111, while also belting 34 dingers. In five years with the Cubs, Baez has continued to improve as an all-around player as this youngster is brimming with confidence. And as Baez’s flash and style are infectious, he will once again be a part of a Cubs team that wants to make another run at the World Series Title. In 2018, the Cubs team earned run average of 3.65 was a big reason why they were able to get to the postseason, and Maddon will need those arms to come through once more. 35-year old Jon Lester is fresh off of winning 18 games for the Cubs last season, and although that he is not the strikeout pitcher that he once was, he does know how to pitch to contact, while relying on the defense behind him. However Lester must focus on keeping the baseball low in the strike zone because ill afford to leave it up as hitters will have a field day off of him at Wrigley if and when the flags are blowing out. Last season the Cubs were able to acquire starting pitcher Cole Hamels from the Texas Rangers, and he was more than happy to be back in the National League. In seven starts with the Cubs, Hamels posted an earned run average of 2.36. Hamels was a big part of the Philadelphia Phillies winning the World Series in 2008, and although that he is now an older pitcher, he is crafty, and like Lester, it will be imperative for him to locate his pitches. Last year the Cubs signed starting pitcher Yu Darvish to six-year deal for $126 million. But things did not work out as Darvish only made four starts for Chicago due to an elbow injury. Darvish has previous elbow issues during his time with the Rangers, and at this point the Cubs will not be able to put a ton of stock in him being able to remain healthy. The National League Central will be a battle all season, and these Cubs have what it takes to be in the mix for another division crown. Consistency is the name of the game for the St. Louis Cardinals as they have only produced one losing season since 2000 which includes winning a pair of World Series Titles in four appearances in the Fall Classic. But even with the Cardinals ability to win, it has not resulted in always getting to the postseason as each of the last three years have seen them miss the playoffs. 2018 also saw St. Louis do something that they hadn’t done in 23 years as they parted with a manager mid-season. However with the dawn of a new Major League Baseball season upon us, the Cards will look to build off of their second half surge in 2018 that saw them miss the postseason by just 2.5 games. As Mike Shildt is set to begin his first full season as the manager of the Cardinals, he has a lineup that has the potential to be one of the best in the National League. Last season the Cards hit 205 homers which was fourth in the N.L., and this off-season saw them acquire first baseman Paul Goldschmidt from the Arizona Diamondbacks. In eight years with the Diamondbacks, Goldschmidt averaged hitting 31 homers per year, but he was more than just a power hitter as he is a career .297 hitter. Goldschmidt is always a perennial N.L. MVP candidate as his ability to hit as well as his professionalism will be a welcome addition in St. Louis. The Cardinals have been one of the best organizations in Major League Baseball in regards to transitioning from one era of player to another,and the latest notion of that is how infielder Matt Carpenter has become the new face of the franchise. Carpenter has come into his own as he falls into the category of player that will do “whatever it takes” to win. Carpenter hit a career-high 36 home runs last season, and even though he only batted .257, he had an on-base percentage of .374. As previously mentioned, Carpenter will do whatever is necessary to win, and although that he might not fall into the category of being an MVP candidate in the National League, he will still have a solid campaign while being vital to any success that St. Louis plans on having. 2018 marked outfielder Marcell Ozuna’s first season in St. Louis, and even though that he wasn’t able to replicate his production in 2017 with the Miami Marlins, he still put together a solid campaign. Ozuna batted .280 last year for the Cards, while driving in 88 runs, and launching 23 homers. Ozuna didn’t have the protection of outfielder Giancarlo Stanton in the lineup with him like he did in 2017, but he was one of the Cardinals most consistent hitters all season which should translate to another solid season for both he and the Red Birds. At the age of 36, catcher Yadier Molina may no longer be an MVP caliber player like he was earlier in his career, but don’t sleep on what he brings to the table for this Cardinals team. Molina is a nine-time All-Star and arguably the best defensive catcher of all-time. Age along with the wear and tear of squatting behind the plate for so many years are beginning to catch up with Molina in regards to stealing from his ability as a hitter, but he is still one of the best in the business in regards to calling a game. And the Cardinals would add more depth this off-season behind the plate when they picked up veteran catcher Matt Wieters. Wieters is a four-time All-Star who like Molina has been known to call a good game behind the plate for a pitching staff. And if Shildt wants to utilize both Molina and Wieters in the lineup at the same time, you’ll see each of them receive some time at first base. The Cardinals continue to employ one of the best pitching staffs in the National League in spite of the fact that they are not littered with household names. Last year starting pitcher Miles Mikolas was able to shed his label of being a journeyman as he won 18 games which was tied for the top spot in the National League. However it will be tough for Mikolas to replicate that success in 2019 due to the fact that he also led the N.L. in hits allowed as he surrendered 186 last season. Injuries have gotten the better of starting pitcher Adam Wainwright in recent years, but even at the age of 37, he still knows how to pitch as his years of experience in Major League Baseball will be a welcome sight for this pitching staff in St. Louis. The Cardinals will definitely give both the Chicago Cubs and Milwaukee Brewers a run for their money in the National League Central, but it might not be enough for them win their first division title since 2015. After barely missing out on making the playoffs in 2017, the Milwaukee Brewers were able to build off of that in 2018 en route to winning their first National League Central Title in seven years. And even though that the Brewers were able to accomplish plenty last season, they headed into off-season asking themselves what could have been. Milwaukee reached the National League Championship Series, but they could not overcome the Los Angeles Dodgers as they fell to them in seven games. Now for Brewers manager Craig Counsell and his team, they must put last season’s playoff disappointment behind them in order to build off of that as they look to win the franchise’s first World Series Title. Last year the Brewers were reminiscent of “Harvey’s Wallbangers” as they were third in the National League in home runs which included three players going yard at least 30 times. Milwaukee took advantage of the fire sale of the Miami Marlins as they acquired outfielder Christian Yelich who paid huge dividends for them. In Yelich’s first season with the Brewers, he led the N.L. in batting (.326), while also hitting 36 homers, driving in 110 runs, and stealing 22 bases. And when it was all said and done, Yelich would be crowned at the N.L’s MVP. But as good as Yelich was in 2019, what will he be able to do for an encore here in 2019? When you think of MVP candidates, the first thing that come to mind is being a power hitter, but in the case of Yelich there are so many ways that he can effect a game. Yelich had an on-base percentage last season of .402 . However one aspect of Yelich’s game that he will need to work on heading into the new season will be that he only drew 68 walks last season as compared to 135 walks in 2017. And if Yelich is able to improve on his plate discipline, there is no reason to believe that he won’t be in the running to once again be the National League MVP. Aside from Yelich’s emergence last season, the Brewers were also happy with the play of first baseman Jesus Aguilar. After Aguilar’s career was going nowhere with the Cleveland Indians, the Brewers picked him up off of the scrap heap in 2017. And in a very short period of time Aguilar has gone on to become one of the more feared sluggers in the National League. Aguilar was one of Major League Baseball’s breakout performers last season as he hit 35 home runs to go along with 108 runs batted in. At 6’3″, 250 lbs., Aguilar has the ability to hit no doubters and he give the fans that are sitting in the seats beyond the outfield wall at Miller Park plenty of opportunities to go home with souvenir baseballs. Like Yelich, outfielder Lorenzo Cain was an acquisition by the Brewers last off-season, and he was a big reason why they were able to win the National League Central. Cain provides the Brew Crew with championship experience as he helped the Kansas City Royals win the World Series in 2015, Cain has always had a propensity for getting the big hit, while his glove always seems to find the ball in the outfield as his clutch aspect is something that a team needs if they have any title aspirations. Cain is not the only former Royals players that was vital in Milwaukee winning the National League Central last season as the acquisition of third baseman Mike Moustakas just prior to the trade deadline helped Milwaukee’s cause. For the second consecutive year Moustakas hit free agency seeking a big payday, but he would have to settle for a one-year deal for $10 million with an option for 2020. And like Cain, Moustakas has a knack to perform in the clutch as his ability to get extra-base hits will definitely benefit the Brewers as they make a push to repeat as division champs. At the age of 35, outfielder Ryan Braun has seen his fair share of ups and downs with the downs being brought on by his own doing. Braun has put a Major League Baseball suspension for performance-enhancing drugs behind him and he has continued to be a solid contributor to Milwaukee’s lineup. Braun is no longer the MVP candidate that he was earlier in his career, but he is some who’s bat will give the Brewers more depth. After being traded by the Boston Red Sox in 2016, infielder Travis Shaw has found a home for himself in Milwaukee. In two seasons with the Brewers, Shaw has cranked out 63 home runs. However Shaw knows how the spray the baseball all over the field when keeps the opposing defense on its toes. Shaw might not be an All-Star caliber player, but that will not prevent him from being vital to the Brewers success this year. Last season the Brewers were fourth in the National League in regards to earned run average in spite of the fact that they only had one starting pitcher win at least 10 games. Milwaukee is a club that has strongly focused on sabermetrics which has resulted on them relying on their bullpen immensely. This philosophy left the Brewers one game short of making the World Series last season, but will the power arms in their bullpen such as relief pitcher Josh Hader to be lights out once again for a full 162-game season? The month of April will see the Brewers have a wealth of clashes with their brethren from the National League Central. Milwaukee will once again find themselves in a battle with the Chicago Cubs in the N.L. Central, and thus they will not have that much room for error if they want to repeat as division champs. The Pittsburgh Pirates spent the entire 2018 Major League Baseball season hovering around .500, but they would manage to find a way to finish with a winning record for the first time since 2015. The Pirates were not the most talented team in baseball, but they fought, scrapped, and clawed all season long which is a credit to their manager Clint Hurdle who knows how to get the most out of his team while also playing the underdog card. And as the Pirates are set to embark on the 2019 MLB season, will they be able to fly under the radar in order to secure a playoff berth in the National League? Pittsburgh’s team earned run average of 4.00 was eighth in the National League last season, while their 85 quality starts were seventh. One building block for the Bucs heading into this season is that they’ll have a pair of 14-game winners returning to their rotation in starting pitchers Trevor Williams and Jameson Taillon. Both Williams and Taillon made more than 30 starts, while throwing more than 170 innings, and that endurance, as well as their ability to strike out batters along with pitching deep into games could make Pittsburgh a sleeper in the wild card race in the N.L. Last season the Pirates acquired starting pitcher Chris Archer from the Tampa Bay Rays just prior to the trade deadline. And in 10 starts with the Bucs last season, Archer went 3-3 with an earned run average of 4.30. Archer is now 30-years of age, and whereas he relied on his fastball to strike batters out earlier in his career, it is time for him to utilize his slider and changeup more in order to get hitters out which means that he’ll need to pitch to contact more. Pirates pitching coach Ray Searge is set to begin his ninth year with the organization and if he can work with Archer on location, the veteran could have one of the best seasons of his career. And if the Pirates are able to take a lead into the late innings, they have a bullpen that is more than capable of wrapping things up. Relief pitcher Edgar Santana has 20 holds last season while handing the baseball off to closer Felipe Vazquez in the ninth. Vazquez’s 37 saves in 2018 were third in the National League as hitters had difficulties in catching up to his fastball. Vazquez can frequently hit 100 miles per hour on the radar gun which also factored in to him being able to strike out 89 batters in just 70 innings of work as he has rapidly become one of the premier closers in the National League. Last season Pittsburgh was a middle of the pack club in the National League in regards to most offensive categories, and if they are going to turn things around while becoming contenders in the N.L. Central, players such as outfielders Gregory Polanco and Startling Marte will need to have big seasons. For Hurdle and his Pirates, their first 12 games this season will be versus the National League Central as this a stretch that could make or break their campaign. Unfortunately for the Cincinnati Reds, they will enter the 2019 Major League Baseball season fresh off of five consecutive losing seasons with the last four resulting in last place finishes in the National League Central. The Reds find themselves in the middle of a rebuild, while the competition in the N.L. Central is as tough as it has ever been which is a big reason why they’ve been cellar dwellers. But as the dawn of a new season is upon us, Cincinnati is hopeful that their moves this off-season will get things turned around for one of MLB’s oldest franchises. David Bell enjoyed 12 seasons as a Major League Baseball player, and after spending the last five years as an assistant coach with the St. Louis Cardinals and Chicago Cubs respectively, he is now tasked with being the field general for the Reds. Throughout Bell’s MLB career, he was always known for being a scrappy player that would do whatever it took to win, and now he will attempt to employ that same attitude to his new team in Cincinnati. Since moving to the Great American Ball Park in 2003, the Reds have generally been able to click on offense as it has been a hitter’s park. One player who embodies that notion is Reds first baseman Joey Votto. In 12 seasons with the Reds, Votto has become one of the most prolific hitters in franchise history which in itself is an accomplishment due to the fact that this is an organization that has been littered with tremendous sluggers. Votto is a lifetime .311 hitter, while his career on-base percentage is at .427. And even though that Votto is now 35-years of age, he is not showing any huge signs of slowing down as he is a “professional hitter”, but more importantly he is a leader in the clubhouse which makes him someone that Bell will lean on this season. Over the winter the Reds surprised many people when the made a seven-player deal with the Los Angeles Dodgers. Two of the biggest names that were involved in the trade were a pair of outfielders in Matt Kemp and Yasiel Puig who became expendable as the Dodgers were looking to dump salary. After having a lull in the middle of his career which was result of injuries, Kemp has rebounded to become a solid Major League Baseball player. Kemp’s bat kept the Dodgers offense afloat during the first of 2018 until the team was able to somewhat get healthy, and he was a big reason why Los Angeles was able win the National League Pennant for the second consecutive year. In 13 MLB seasons, Kemp has seen it all as he’s had his fair share of ups and downs, while navigating his way in some of the game’s biggest media markets, to some of its smallest. Like Votto, Kemp is a veteran player who is 34-years of age, but what Bell and the Reds will get from him who going to come to the park everyday ready to play, while his ability to drive the baseball the other way should allow to get plenty of big hits at the Great American Ballpark. And just like Kemp, Puig has been a fixture with the Dodgers. Puig made his Major League Baseball debut with the Dodgers in 2013 after he defected fron his native Cuba. And during Puig’s tenure in Los Angeles, he was a player that captivated and frustrated fans in the same breath. In one inning Puig would showcase the skills necessary to make him a Hall of Famer, and in the very next frame he’d make a blunder that would leave people scratching their heads. But the biggest thing for the Reds as they must figure out what version of Puig that they are getting as we don’t know if he is going to resemble “Charlie Hustle”, or Roger Dorn. And as the Reds are continuously one of the best slugging teams in the National League, one player to keep an eye on will be third baseman Eugenio Suarez. In four seasons with the Reds, Suarez’s numbers at the plate have continued to improve. And Suarez enters this season coming off of his first All-Star Game selection as he batted .283 to go along with 34 homers, while driving in 104 runs. Suarez is no longer flying under the radar in regards to being a big-time part of the Reds offense and all signs point to his production not tapering off in 2019. Second baseman Scooter Gennett enters the 2019 Major League Baseball season as another stalwart in the Reds lineup. Gennett made his first All-Star team in 2018, and he should once again benefit from playing 81 games the hitter friendly Great American Ballpark. There is no questions that the Reds are going to hit, but it will come down to whether or not that they’ll be able to get enough out of their pitching staff. Last year Cincy was 14th in the National League in earned run average at a clip of 4.63, while their 67 quality starts was dead last. Derek Johnson is embarking on his first year as the Reds pitching coach, and his biggest task will be to get more out of this staff that did not have a starting pitcher produce a winning record last season. The Reds were busy on the trade front to find a way to remedy their pitching woes as they’re hopeful that the combination of starting pitchers Sonny Gray and Alex Wood can turn things around. In nearly two seasons with the New York Yankees, Gray was never able to rekindle the magic that made him dominant with the Oakland Athletics. There is the possibility that pitching in New York City for the Yankees was too much for Gray, and playing a small-market like Cincinnati can help regain the previous form that he had in Oakland. In the case of Wood, he was able to win 16 games with the Dodgers in 2017, but he wasn’t able to catch lightning in a bottle once more in 2018 as he lost some zip and confidence on his fastball. A back injury will keep Wood inactive to start the season, but when healthy he’ll need to work on keep the ball low in the zone, or he’ll get torched at the Great American Ballpark. But if the Reds are able to get enough quality innings out of their starting rotation, relief pitcher Raisel Iglesias is emerging as one of the better closers in baseball. Over the last two seasons Iglesias has saved 58 games. The Reds first 10 games of 2019 will be exclusively against the National League Central, and a strong start within the division could be just what the doctor ordered for them to make some, while possibly making a run at the postseason.